There is a new beta build for Shade. I've started a new thread since the old one was getting pretty massive. Consequently the discussion thread is now also public. - Canvas scroll position coordinates have been adjusted as they were incorrect. I am very excited to see this new app. After years with Codea as a primary go-to app for me, Shade will be an exciting addition. Upon release, will the price be fixed as shown in the TestFlight beta now? Thanks again! I’m a full-time software developer in the day and a i-just-want-to-write-top-notch-professional code in Codea in the evening. I’d love to see Codea reach a tipping point where many, many user-created apps show off the true potential of using Codea (with Shade, Working Copy, etc.) to develop directly on the iPad. Do you have an estimated/targeted release date in the app store? @John, @Simeon - Shade is looking like a polished product now. Good examples and the reference section, with the videos, gives a good intro. The new entries in the library section look interesting - will you be adding sections in the reference to describe their use arc? One thing I think may be missing is an about section including the version number. Also Codea has a good opening project page which identifies Codea to the user - very impressive. Shade currently opens to a file listing have you any plans to add a Shade page on opening. An alternative might be to open in the editor with a default shader - you could also include in it an image with the TLL logo Shade logo and version number. The user could then close that and go to the filer. Just an idea. @Bri_G yeah I kind of disklike the file picker as the opening screen. Apple recommends you use it as the opening screen but I prefer your idea of going to a default shader or the last one you were editing. I might just try a few things and see how it feels. Added a bug to the trello board. When I open a shader I was working on in an older version, it gives an error but doesn’t crash completely out. I’m new to the beta testing side of things here - it bug reporting via Trello the expected approach, and how do I access the board? Also, exporting broken shaders is a pain in the rear. Had to export it from Files to Working Copy - git push to a repo (I made an odds and ends one for things like th0is) - then git clone down on a computer and push out to Dropbox. Public to view, but I suppose I’ll need an invite to be able to post to the board? Is there a Codea beta board as well? @athros I'll look at putting in a zip-export option to make things easier. The other option is to use iCloud which lets you just drop shaders right in and syncs automatically. @iam3o5am If you have a Trello account that should be enough to post. Don’t worry too much about it @John I just wasn’t expecting it to take so much. The water advanced shader example throws an error. @piinthesky Thanks, having a look into it. @john - just loaded the latest version 14 up. Ran in to an issue of not being able to load up examples or get past iOS file screen,until I re-installed examples, closed Shade and restarted. Then I loaded one of my early trials, the shader was off screen and the zoom window showed tiny images in the top right corner. After scrolling across the screen I managed to get the green rounded rectangle onto the zoom window and moved it to the top right, when the shader moved onto the main screen but small in size. Zooming the window had little effect. So I used the zoom rectangle to search the corners of the zoom window. I finally found two nodes, which I deleted which resulted in the zoom box showing several grey boxes (mini nodes). Once you know about scrolling to get the green rectangle on the zoom window and searching the perimeter it’s fine - must admit I panicked initially. Also, the zoom window seemed to disappear after a period of time, I assume this is a design feature. Otherwise - now looking really smart, thanks. @John Just loaded the latest Shade. Was just trying some simple things and ran into this error. See image below. There was no way to correct it. Closing and opening the shader or Shade itself didn't let me correct it. Had to delete the shader. @Bri_G did your own shaders fail to load as well? Or just examples? @dave1707 that's a new one. Was this one particular shader that was refusing to load and others were working? @Simeon It was only on my new shader. The other shaders opened fine. Connecting Scene Color to Offset caused the error. @Simeon - I didn’t try with my own shaders until after I re-ran and re-installed examples. @dave1707 thank you that narrows it down. We updated Color to be a 4-component (RGBA) instead of 3-component (RGB). So I think this might be because of that. @dave1707 @Bri_G The issue with some examples is caused be the changes to the Color node. I thought I had it covered with an automatic migration step but it seems like there are some edge cases I hadn't considered. Plugging Scene Color into offset shouldn't cause any problems so I'll have to investigate that one. How closely will codea and shade share, swap or sync shaders? It would be perfect to have a “Shade” folder in codea’s shader lab assets tab. 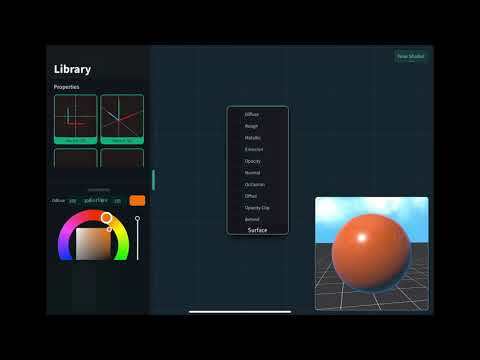 Will it be possible to import a hand written shader from codea into shade’s node based setup? A code view within shade? To inspect and maybe even edit by hand? It would be great to be able to see (multiple/all) input/output values change in realtime. Thanks for the cool app, keep up the good work! Seeing all the values change is a cool idea. Though I guess you'd have to pick a single fragment or vertex to "watch" because otherwise you are seeing all the values change inside the node preview itself.